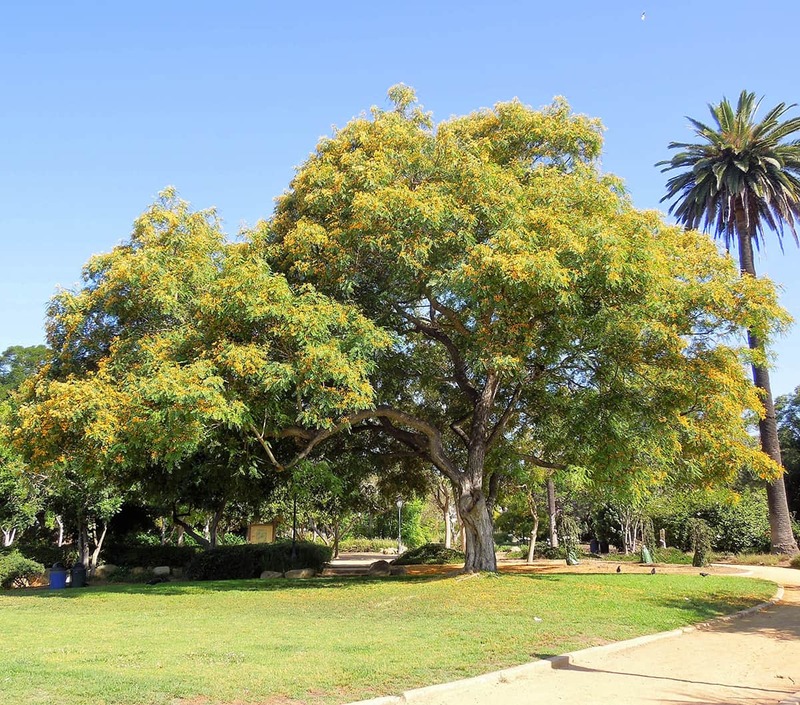 The Tipu (pronounced “Tee-poo”) Tree, also called Pride of Bolivia, is an ideal choice if you are looking for a tree that will grow quickly and will provide cooling shade over a large space; for these utilitarian reasons, it has often been selected for Santa Barbara’s parks and parking lots. 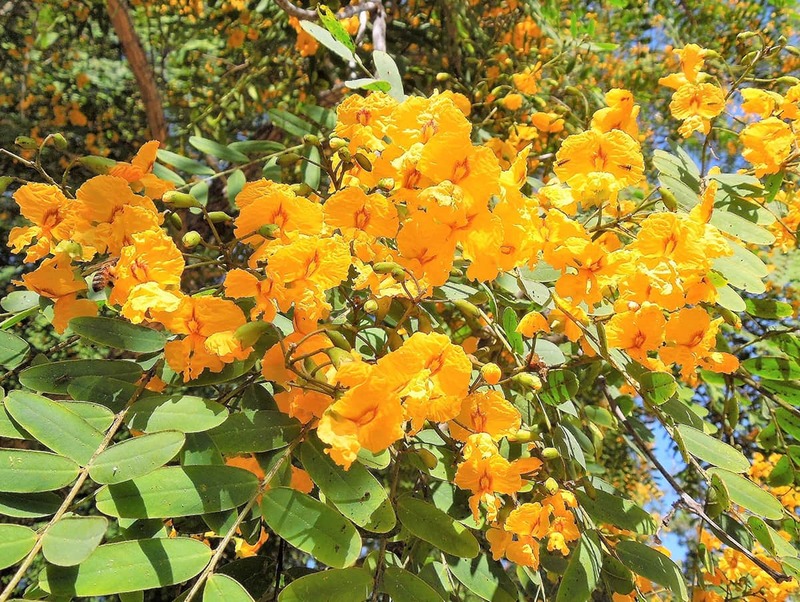 Of course, its aesthetic qualities have also been appreciated – beautiful, yellow-orange, flowers and long, weeping, boughs, which add quite an exotic and tropical appearance to our landscapes! In the winter, the Tipu Tree is briefly deciduous; in the spring, it pushes out bright-green, 12-inch long, fern-like, compound leaves. In the summer, its flowers (3/4” wide, displayed June through August) provide a delightful show in the canopy, are attractive to bees, and, when fallen, create a lovely yellow-orange carpet. In the fall, its seed pods appear – these are winged (they look like one-half of a maple tree seed) and, consequently, spin lazily as they drop off. Because of its growth potential, the primary consideration in planting a Tipu Tree is providing adequate space for its ultimate canopy and root system. In only ten to fifteen years, it will easily reach a height of 30 feet, with an equal or greater spread; at maturity, it can reach a height of 50 feet! Since it is such a fast grower, it is important to train the branch structure while the tree is still young. This native of South America has made itself perfectly at home in Santa Barbara’s microclimates. It is not fussy about our various soils, is happy enough with our normal rainfall, and, after three to five years of establishment, will tolerate some drought. It will look better, not surprisingly, if given several deep watering sessions during the dry season. In wetter areas worldwide, it can be invasive, but this is not a problem in our Mediterranean climate, because it does not grow here from uncultivated seed. The Tipu Tree’s botanical name is Tipuana tipu. The genus and species names are derived from “Tipa”, its common name in South America. Tipu Trees have been planted and enjoyed in Santa Barbara since the late 1800’s. They are street trees in the 200 block of West Ortega Street, the 1200 block of Punta Gorda Street, the 600 and 700 blocks of West Valerio Street, the 500 to 700 blocks of Voluntario Street, and several blocks of Cacique Street. They are also seen in Alice Keck Park Memorial Gardens, in Franceschi Park (a 60-foot tree! ), in the City parking lot at 400 W. Carrillo (a virtual forest of Tipu), and in many of our residential and commercial landscapes.